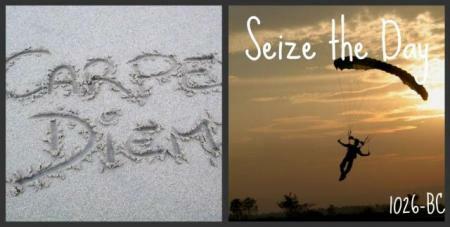 Some words that I choose to live my life by are "Carpe Diem" which is Latin for "seize the day". This means that I try to live every day to the fullest and not to have any regrets. In one of my favorite movies, The Dead Poets Society, the actor Robin Williams plays a teacher at a very strict school. He tells his class of all boys, "carpe diem, seize the day boys, make your lives extraordinary". Those words have always stuck with me. I want to live each day to its fullest so I have no regrets and when I'm older I can look back on my life and think it was extraordinary. Sometimes it's hard to live by these words because other things get in the way, like school work or other work obligations. But when I feel myself forgetting these special words, I take a step back and remember that I cannot become so consumed by my work and that I must make sure I am enjoying what I am doing each and every day. I advise the both of you to also try to live by these words. Carpe Diem. Seize the Day.